Damn damn damn. 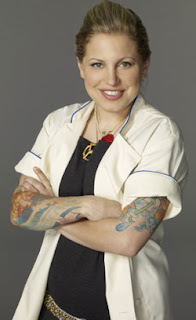 I mean, c'mon, I know Jamie botched the dish, but at least she put some effort into it and knew what she did wrong. Leah just seemed clueless and apathetic. I wish they could have kicked her off after the quickfire challenge actually. How can you be a professional chef and be so friggin' lazy? That's two straight weeks that they've booted the wrong person. I'm starting to fear for Stefan. I need to go back to Le Bern. Looks like they've redone the dining room since I went. Though I'd hope that was the case being that it's been about 10 years. God ... is it that long? I REALLY need to go back. could not have been 10 years. i know it happened after i got here, and i haven't been here 10 years yet. Actually yeah, you're right. Definitely not 10 years. Still, it's been too long. I have a New York trip coming up in April; maybe I'll do lunch there. It's only $64. By the way: Pablo Escolar? Really? Yeesh. (channeling Carla) Gail? GAIL??? yeah, the pablo escolar line made me cringe. because he clearly thought it was quite clever. My girl Carla's going to the finals! You watch! ... Hey, I've never predicted she would win, though. And yes, I was watching them serve 6 dishes to 6 contestants and wondering why they weren't examining them with a microscope. How could you NOT know they were going to make you duplicate those dishes. I can't believe Leah and Josea (sp?) are still in this. This week's episode just made me realize more that Jeff got the shaft. He deserves to be going to the finals as much as Leah or her non-boyfriend. Jeff absolutely got hosed. Maybe he tried to do too much with his dishes, but I'll take that 10 times out of 10 over someone like Leah who just flat-out gives up and doesn't appear to have ANY passion for cooking. At this point I'm seriously rooting for a Carla vs. Stefan final. i'm still not convinced carla is in the finals. at some point, it HAS to strike midnight. i think hosea will end up there at the end. i am somehow convinced he is better than he has shown so far, tho i admit that it may be because he keeps saying he is better than he has shown so far. and i still think that stefan is going to trip. the only wire-to-wire favorite so far has been harold in season 1, and stefan doesn't have the humility to pull it off. we'll see.